Easy and gently descending flowtrail, best choice for beginners and families with kids. Swinging, playful and continuously descending flowtrail. Contains many bumps, rollers and berms. Favorite choice of riders from intermediate level to experienced trail enthusiasts. Playground for experienced bikers. Trail with natural surface, bigger and longer rollers and bumps, steeper descents and technical trail features. Freeride and downhill sections for real experts. Downhill track is the venue of the prestigious iXS Downhill Cup and the Czech downhill national championship 2018. 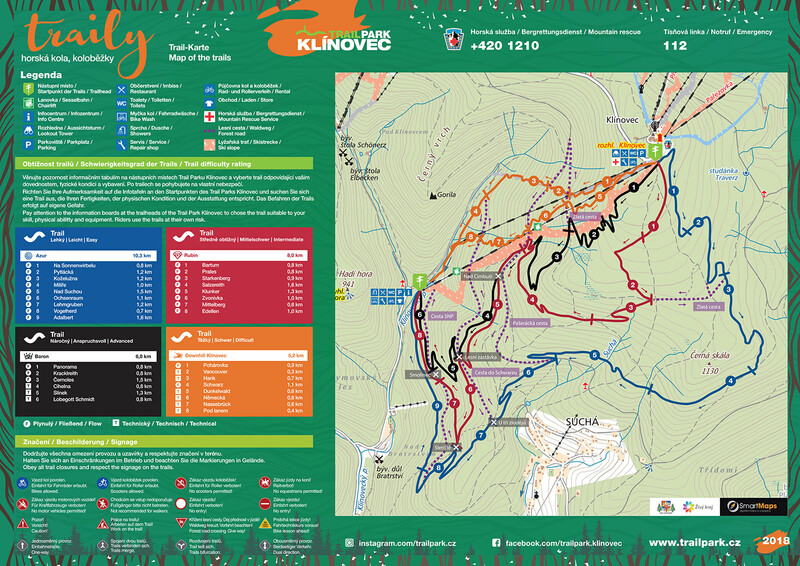 Pay attention to the information boards at the trailheads of Trail Park Klínovec to choose the trail suitable to your skill, physical ability and equipment. Smoother and more predictable surface, open turns.